Published: Jan. 23, 2014 at 03:49 p.m. 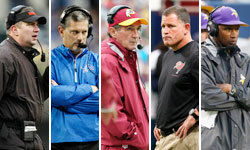 Updated: Jan. 23, 2014 at 04:12 p.m.
After weeks of being without a head coach, the Cleveland Browns have wrapped up their search. On Thursday, the Browns hired former Buffalo Bills defensive coordinator Mike Pettine to replace Rob Chudzinski, who was fired in late December. Cleveland Browns: The Browns announced Thursday that they have hired former Bills defensive coordinator Mike Pettine to be their next head coach. The Browns took a lot of heat for being the last team to make a hire, but "Around The League's" Marc Sessler writes that Pettine was worth the wait. Minnesota Vikings: Rapoport reported that Bengals defensive coordinator Mike Zimmer has been hired as the Vikings' next coach, per a source informed of the deal. Norv Turner, formerly of the Cleveland Browns, has agreed to be Zimmer's offensive coordinator, Rapoport and NFL Media columnist Michael Silver reported Saturday per Vikings sources and sources familiar with the Browns' thinking. Detroit Lions: The Lions hired Jim Caldwell to be the team's new head coach, NFL Media Insider Ian Rapoport reported Tuesday. Caldwell, the Ravens' offensive coordinator this past season, impressed the Lions during his interview earlier this month when he broke down how he would help quarterback Matthew Stafford. According to Rapoport, Baltimore Ravens secondary coach Teryl Austin will be Caldwell's defensive coordinator. The Lions' official web site reported that New Orleans Saints quarterbacks coach Joe Lombardi -- Vince Lombardi's grandson -- has agreed to become Detroit's new offensive coordinator. Tennessee Titans: Tennessee has hired Ken Whisenhunt as the Titans' next coach. The former Arizona Cardinals coach spent this past season with the San Diego Chargers as their offensive coordinator. Rapoport reports that, per a source close to Whisenhunt, one name to watch for the offensive coordinator spot is John McNulty, the former Tampa Bay Buccaneers quarterbacks coach. McNulty previously worked with Whisenhunt on the Cardinals' staff. Ray Horton has been hired as defensive coordinator. Washington Redskins: Cincinnati Bengals offensive coordinator Jay Gruden has taken the helm in Washington, NFL Media's Jeff Darlington reported per sources familiar with the negotiations. Darlington also reported that the new coach will keep defensive coordinator Jim Haslett, according to a source informed of the new coach's plans. The Redskins introduced Gruden at a news conference shortly thereafter. Tight ends coach Sean McVay has been elevated to offensive coordinator. Houston Texans: Former Penn State coach Bill O'Brien is the team's new coach. Former Cleveland Browns and Kansas City Chiefs coach Romeo Crennel met with O'Brien about the Texans' vacant defensive coordinator position, Rapoport said. The Houston Chronicle later reported that Crennel will take the job. Tampa Bay Buccaneers: Former Chicago Bears coach Lovie Smith was hired as the Buccaneers' new coach. Rapoport reported that former Cal coach Jeff Tedford has finalized a two-year deal to be Smith's offensive coordinator, while former Minnesota Vikings coach Leslie Frazier has taken the defensive coordinator post. New York Jets: Owner Woody Johnson announced after the Jets' Week 17 win in Miami that Rex Ryan will be back as head coach in 2014. Rapoport reported Thursday that Ryan and the team agreed to a contract extension, per a source informed of the deal. The team later confirmed the news. Rapoport added that the contract includes one additional guaranteed year through 2015 and future unguaranteed years. Dallas Cowboys: Owner Jerry Jones confirmed on his weekly radio show that Garrett indeed will be back in 2014. Jones said he never considered replacing Garrett. New York Giants: Coach Tom Coughlin clarified that he wants to be back with the team, and owner John Mara announced that he wants Coughlin back. They just have to work out the details for a new contract. Offensive coordinator Kevin Gilbride retired after the season, replaced by former Green Bay Packers assistant Ben McAdoo. Miami Dolphins: Owner Stephen Ross made no promises after the Dolphins' Week 17 loss to the Jets, saying he had a "lot to think about." A week later, only coach Joe Philbin was still with the franchise. Offensive coordinator Mike Sherman was relieved of his duties after two seasons on the job, while general manager Jeff Ireland and the Dolphins agreed to mutually part ways, the team announced. Rapoport reported that Philadelphia Eagles quarterbacks coach Bill Lazor will replace Sherman as offensive coordinator, per a person with knowledge of the team's search. Oakland Raiders: A Raiders source told Rapoport that following a meeting with owner Mark Davis, coach Dennis Allen will come back in 2014. Davis told reporters afterward that the meeting "went well" and confirmed that Allen will return next season. However, the future is less certain for the status of the rest of the staff. Silver wrote that the Raiders were offering Allen's assistants only one-year contract extensions. Tennessee Titans: The Titans fired Mike Munchak after three seasons as their coach. According to Rapoport, Munchak could have kept his job if he were willing to make changes to his staff. Munchak had been with the team since he was drafted by the organization -- then the Houston Oilers -- in 1982. Harrison: Coaches for the Hall? Detroit Lions: Jim Schwartz's fate was sealed when the Lions failed to make the playoffs, per Rapoport. He was fired, but Lions president Tom Lewand and general manager Martin Mayhew are safe. Tampa Bay Buccaneers: Greg Schiano was fired after two seasons as head coach, and general manager Mark Dominik also was let go. Washington Redskins: Mike Shanahan was fired as head coach, but general manager Bruce Allen remains with the team and says he has full personnel control. Minnesota Vikings: The Vikings fired Leslie Frazier following a 5-10-1 season. Cleveland Browns: Rob Chudzinski was fired shortly after the Browns lost their Week 17 season finale. Though Chud was out as head coach, Rapoport reported later in the day that the team, for now, will retain its assistant coaches. Houston Texans: In the first firing of the 2013 season, Houston let go of then-coach Gary Kubiak after losing a franchise-record 11th consecutive game in Week 14. The loss put the team at 2-11, and the Texans finished the season 2-14.